My daughter’s 9th birthday was three weeks ago and she wanted a piñata for her birthday. Piñata’s aren’t common in this region, growing up I cannot recall every seeing one; it is something that the new generation picked-up from TV. A piñata is a colorfully decorated container made from paper, cloth or cardboard; and filled with candy and/or small toys. During birthday celebrations, it is hanged from the ceiling and broken with a stick. Children really enjoy the process of breaking the piniata and then gathering the splattered candy! Although Piñatas are associated to Mexico, its origins are thought to be China. As I was preparing for Mariana’s birthday, I searched how to make a piñata and found a few very good on-line tutorials. The one I liked most was by Jennifer Cleaver from the Copycat Crafter and was trilled when Jennifer agreed to guest post her tutorial on my blog. I didn’t get the chance to do this year’s piñata as my daughter got a ready-made one from her aunt, but I am sure going to do it next year. 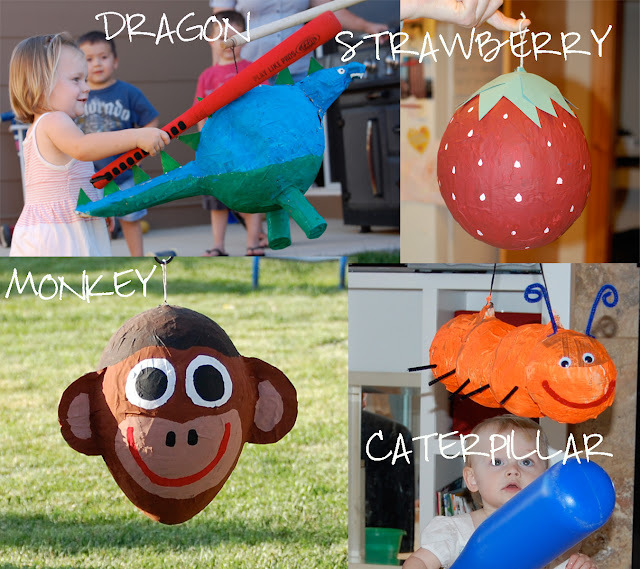 Here is a tutorial because ANYONE can make a piñata --and it's great to save $20! To make your paper mache fill a medium size saucepan halfway with water. Bring it to boil. In a separate container, mix a cup of water with 3 to 4 HEAPING big spoonful's of flour. Add to boiling water while whisking. Bring back to a boil. The mixture should be thick--kind of like gravy, only a little thicker. Once this is done, you can put it in your fridge or freezer to cool it down a little faster. While paper mache is cooling, blow up your balloon to desired size. Then tear newspaper into strips about 4 cm (1 1/2") wide. Once your paper mache is cool enough to handle, spread some of it on to your balloon. Don't be afraid to get a little dirty--USE YOUR HANDS! Then start adding your newspaper strips. Rub more paper mache over the paper. Coat the whole balloon with one layer. Hang it and let dry. Once dry, add another layer. Repeat this process about 4 times. I usually keep the paper mache in the fridge in between layers. Your balloon should start feeling pretty hard. After about 4 layers, cut a small hole in the top and pop your balloon. Then you can insert your candy through the hole. Once you have everything in, cover the hole with more newspaper and paper mache. Also, at this point, you will want to tie some string around the piñata so you will have something to hang it with. After that we usually add at least 2 more layers to the whole piñata using the same procedure. That's it. Not too hard. It does take a few days, but it is fun to see the transformation from balloon to piñata! Hope you enjoyed today’s DIY tutorial: DIY Piñata by Jennifer from The Copycat Crafter. Don’t forget to check her blog where I am sure you will find some nice crafts to do. Jennifer Cleaver: Hello! As a mother of three busy kids, my life is full with the usual grind of laundry, cleaning, cooking, and chauffeuring. To keep my sanity, I love to do some crafting on the side. I like to do things from sewing, painting, kids crafts, and cooking. I share my different projects on my blog The Copycat Crafter, to hopefully pass on some inspiration for craft projects. I hope you'll come take a look and find a project you want to try yourself! Happy crafting!